What should a student wear at a job interview? How can a student best represent themselves when applying for a job? What will be expected of a student when seeking employment? 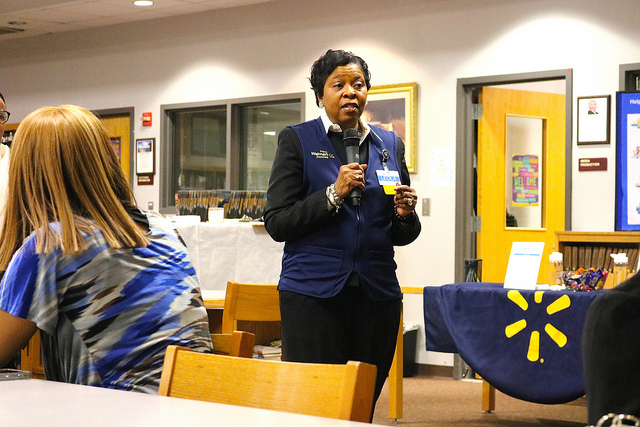 These are just a few questions that were answered for students at a recent event celebrating the partnership between DeKalb County School District (DCSD) and a local Walmart. 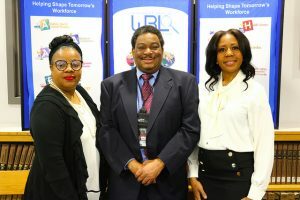 Martin Luther King Jr. High School welcomed Walmart Personnel Coordinator, Leola Hatcher, on March 25. Hatcher—in partnership with the school’s Work-Based Learning Coordinator Regina McComb as well as school media specialists Derek Willis and Betty Mayfield—provided information to students about gaining employment, interviewing, and landing a job at her organization. 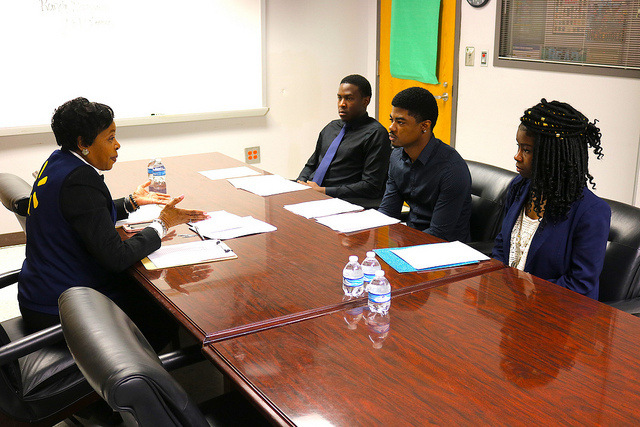 Hatcher also conducted group interviews, seeing which DCSD students would be a perfect fit for the local Walmart, located at 2427 Gresham Road in Atlanta. After meeting with the dozen students attending the event, she was pleased that all are eligible candidates for cashier, cart pusher, and stock positions. These jobs would be ideal for students finishing up their high school career and transitioning to college, Hatcher said. Even students planning to attend college out of the metro Atlanta area are considered prime candidates, as transfers are always available. If hired, attending MLK High students will be able to work during the school day as part of the DCSD’s work-based learning program, which allows students to leave campus for work. Student Jivone Beckford, who already utilizes the program as an employee at Men’s Wearhouse, appreciates how work-based learning provides a better balance between school and the world at large. Though he enjoys his job immensely, he says shifts in retail can be quite demanding when juggling schoolwork. 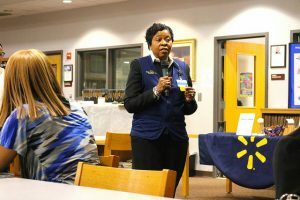 Work-based Learning Coordinator Regina McComb said Walmart is an ideal employer for students due to the company’s round-the-clock schedule and compatibility. According to MLK High School Principal Ennis Harvey, the event, as well as its outcomes, coincide with the school’s mission of preparing intelligent, articulate, mature, knowledgeable, involved, nonviolent and goal oriented (I AM KING) students. Harvey said it is integral for high schools to partner with local businesses to better serve and benefit students.